One of the frustrating downsides of living in Boston is when the public transportation stops running and you are forced to take a cab. Last night was one of those nights when I missed the last T by a millisecond, had to put my stubbornness aside and take a taxi. 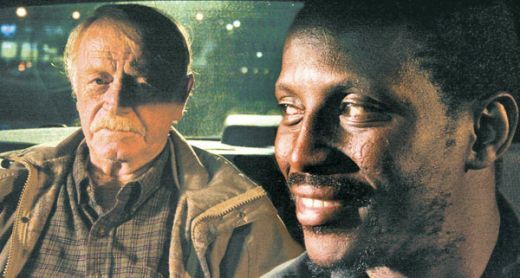 This cab ride ended up making my night because of the resemblance it had to Goodbye Solo, Ramin Bahrani’s 2008 film about a Senegalese cab driver in Winston Salem, North Carolina. Goodbye Solo is one of the three independent films my senior thesis examined and this film has a very special place in my understanding of American film. I have spent hours, days, weeks analyzing scenes from this movie, only learning to love it more the more often I watched it. Solo, the protagonist in Goodbye Solo, is a Senegalese immigrant searching for his American dream. He is married with a sassy stepdaughter and a baby on the way. (His son’s birth cements Solo’s status as an American citizen.) He dreams of leaving his taxi behind and becoming a flight attendant, an aspiration dripping in symbolism. Solo’s life is turned upside down when he meets William, a cantankerous elderly man who asks Solo to drive him one way to Blowing Rock, a place entrenched in North Carolina legend. Solo suspects that William wants to commit suicide and decides to show William kindness and the greatest aspects of life in an attempt to prevent his decision. Solo introduces William to his family and his friends. The two men develop an odd-couple relationship that builds from contempt to a mutual respect that is so touching that the final sequence, set at Blowing Rock, is absolutely heartbreaking in what it does and doesn’t reveal to us about what will happen to these two characters we come adore. Solo is in infallible character and, in my opinion, he is one the best to emerge from American cinema in the past decade. His spirit and passion for life is contagious. This is how director Bahrani intended Solo to be read and appreciated by viewers. 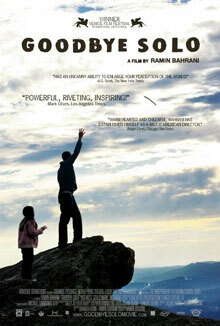 When he began production on Goodbye Solo, Bahrani saw an overwhelming number of depressing films and documentaries about the Iraq War and the general state of the country. He saw the need for a character who could inspire audiences and remind them of the goodness of the human spirit. For me, having watched Goodbye Solo more times than you can even imagine, just thinking about Solo or being reminded of him in any capacity makes me beyond happy. That is why when I set foot in a cab where the driver was a real-life Solo, exuding the same charisma as this fictional character, my night was made and my bitterness over having to take a taxi in the first place washed away. It is moments like this one reinforce that why I love the cinema more than anything else and why, if I am lucky, I can find my way back to studying it one day. Movies have this unparalleled way of finding their way into your life. Stories, characters, performances, scenes – everything on the screen – has a way of only enhancing the banality of the real world. A seemingly mundane cab ride, meant to take me from point A to point B, become something special. That’s the magic of cinema and why movies are just wonderful.